The Coffin design provides for easy and inexpensive installation, and unit may be dismantled without disturbing client side system connections. Parts and service are available on a 24-hour basis, anywhere in the world. All parts provided are inventoried at our parts and service centers or factory locations. Large, accessible hand hole plates are provided for inspection. Internal parts are easy to reach. 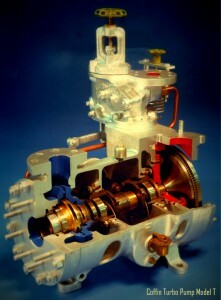 Pumps are designed to allow internal parts to be withdrawn from end after removing casing covers. Special jacking sleeves are integrated into shaft construction for easy bearing removal. For your convenience, Coffin Turbo Pump has factory and field service engineers available to train operators. CTP has a full steam test loop on site at our manufacturing facility in Englewood, NJ for testing and training of our steam units. In addition, the Coffin Pump principle of operation is easily demonstrated by reviewing the cut-away version of our model DE pump. Contact Coffin Turbo Pump today to discuss training or schedule a pump demonstration. View our locations by clicking here.